There is something pretty amazing about getting married at the same place that couples have been saying “I do” for over a hundred years! 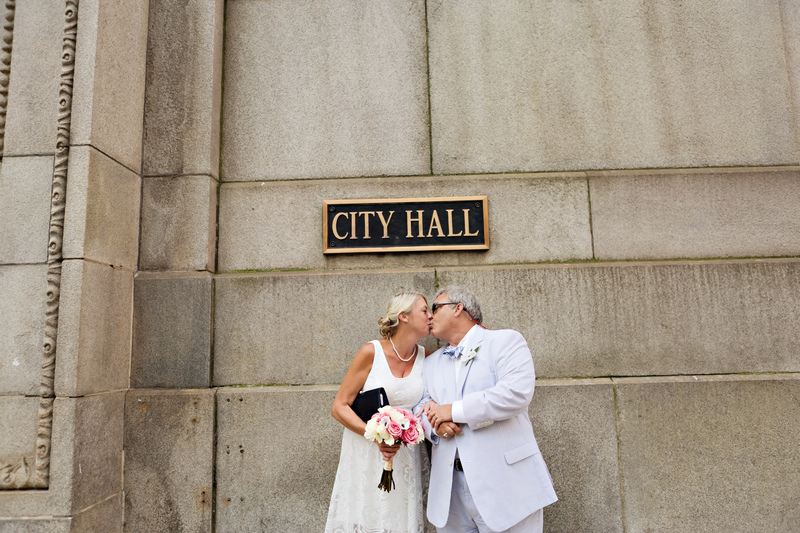 Chicago City Hall (or the courthouse or marriage court) is the choice of many local couples and those visiting the city as well. 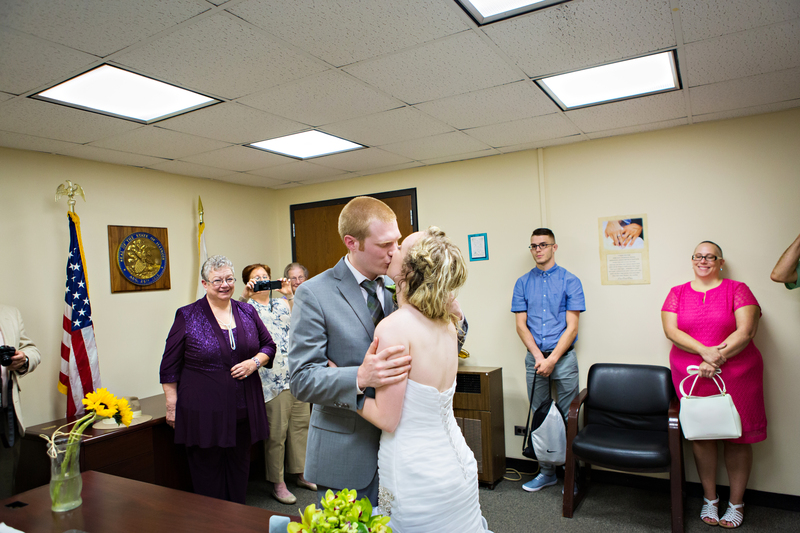 You can get a marriage license one day and be married the next! It really is that easy. 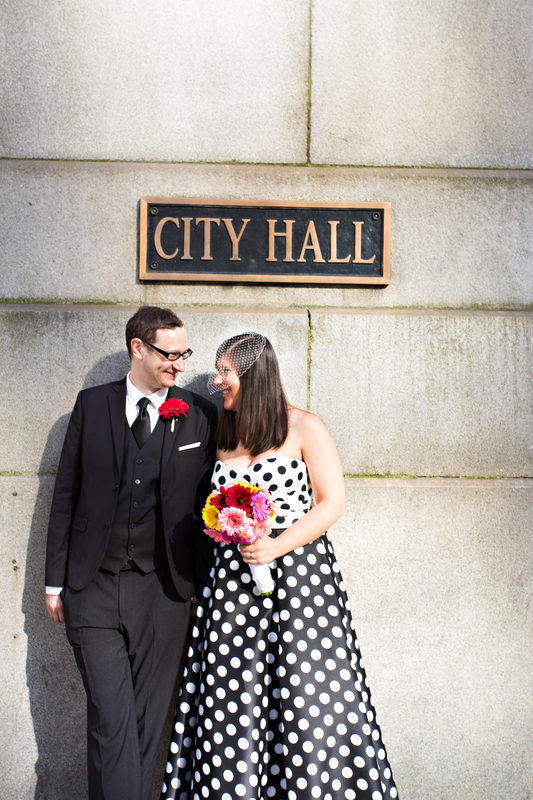 I’ve photographed dozens of happy couples at city hall, so I’d love to share some of the info and tips for anyone planning to do the same. As much as we are all way more interested in the fun details of weddings, it’s important not to over look the legal stuff. 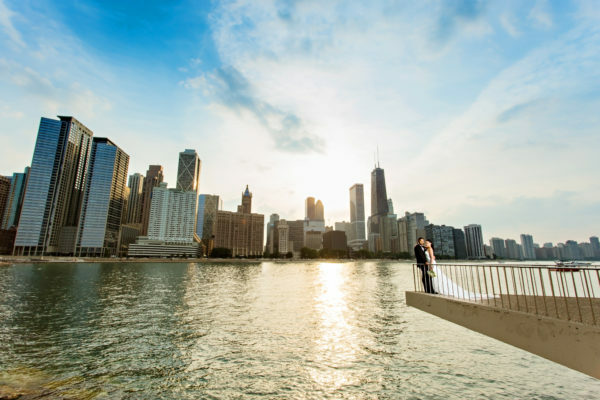 To legally get married in Cook County (the county Chicago is in) both persons in the couple must go to one of the six Clerk’s offices to get a Cook County marriage license. You both must present valid identification and pay the $60 fee. You can fill out the application online now, but you still have to go in person and show ID so I don’t know that it really saves a ton of time. But, it’s an option if you want to jump start the process. Each location has its own hours so check that out on the link. Some locations have extended hours on Wednesdays to stay open until 7pm, like the main downtown branch at 50 W. Washington in lower level of the Daley Center. You must get the license at least the day before in order for it to be valid. It is good for 60 days in Cook County only. No witness is needed in Illinois. Ceremonies are performed on the lower level of City Hall. This is NOT the same building that you got the license. It is across the street. Your best and easiest door to enter is at 119 W. Randolph St. Since the building is massive and takes up an entire city block there are multiple entrances on each side. Once you enter the first set of doors there is an escalator to your left down to marriage court. No need to even enter the main part of the building if you enter through those doors. The hours are 9am-noon and 2-4pm on Monday – Friday and 9am-noon on Saturday. You must get there and check in at least 30 minutes before the end of each session and pay a $10 fee. You may have up to 15 guests, although it will be very tight in the room with that many people! Just an FYI! Getting there early will not get you in earlier. They do not open the doors until the times listed and you can not put your name on the list any earlier than that. So if you arrive an hour early, you will simply be waiting for an hour and the waiting room is only open during the hours listed as well. They are also closed on court holidays and Sundays. Most of those are ones you would suspect (Memorial Day, Christmas, Fourth of July etc.) but there are also a couple ones you might not (like Casmir Pulaski Day). So be sure to check this list before you decide on a date! 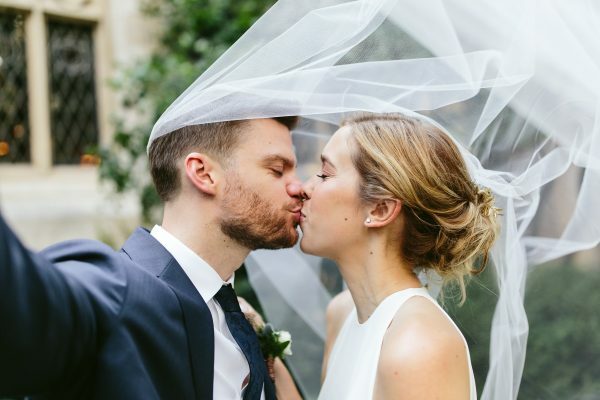 Now that I’ve bored you will all the legal stuff and details, let’s talk weddings! 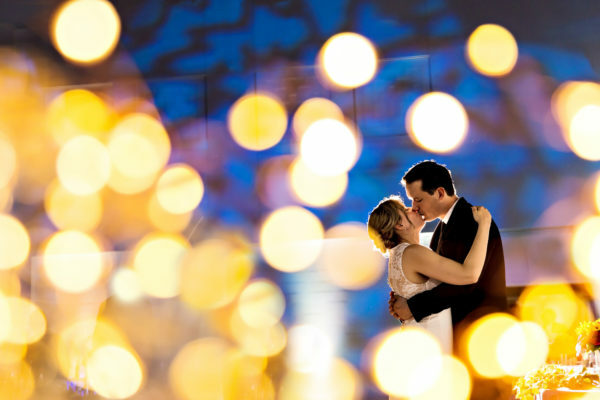 Whether it’s just the two of you running of to City Hall or you are planning bringing a few friends or family, I think the most important thing of every wedding day is to make it what you want. 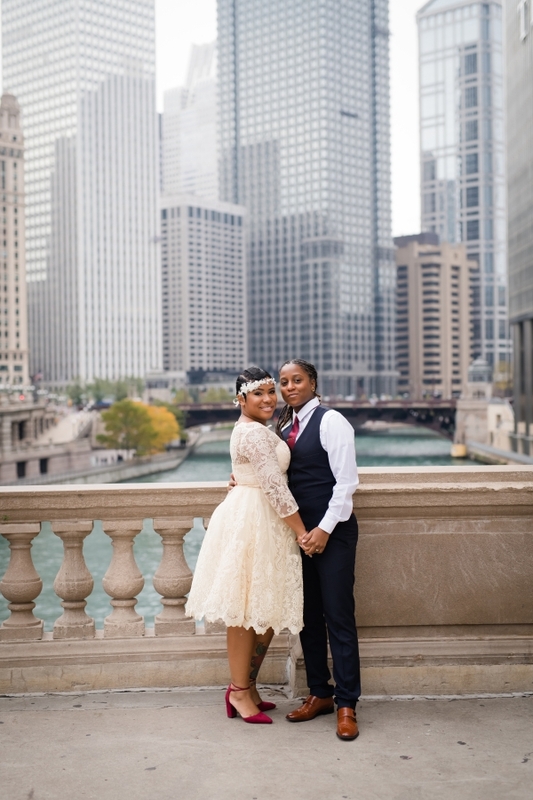 On any given day you can go down to city hall and see couples fully decked out in gorgeous gowns and suits and couples rocking Cubs shirts and jeans! 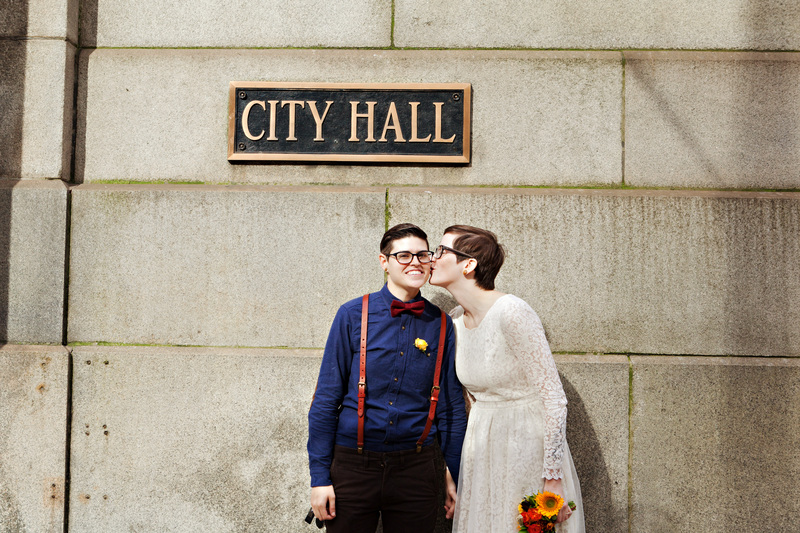 I love the diversity and uniqueness that comes with getting married at City Hall. There are no two days that are the same. There are no rules. Be yourselves! 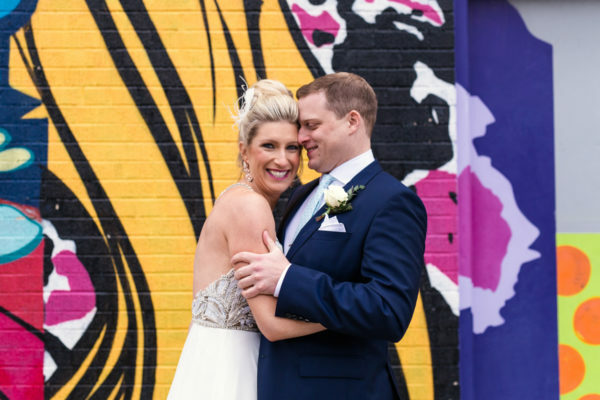 If you’ve always dreamed of getting married in a white dress then rock that out! If there isn’t a single dress in your wardrobe and wearing one would make your friends go, “Are you wearing a dress?! !” then opt for something that is more fitting for you. 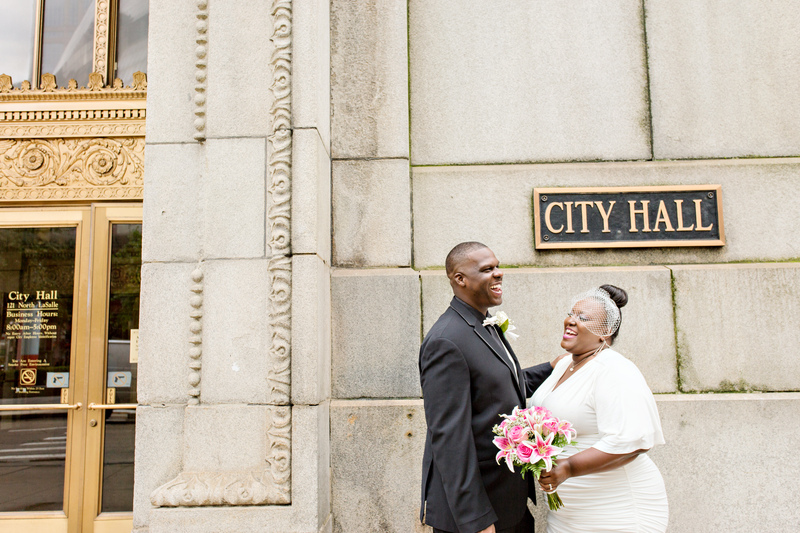 Some couples opt for city hall because they don’t want a big wedding. Some couples like it because it’s a more budget friendly option. Whatever the reason may be, don’t be afraid to be yourself. 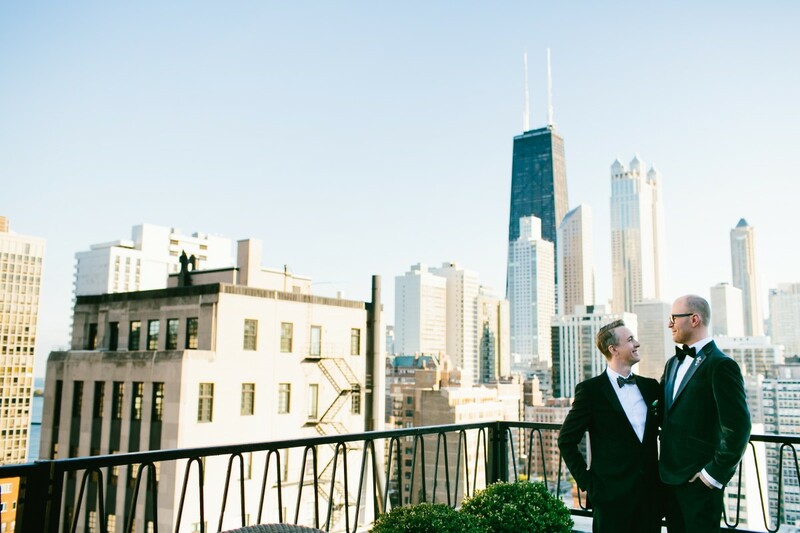 I love small weddings so much that I created a company – Elope to Chicago – that specializes in just that! I decided to build small packages that incorporate the items and services that most couples want, whether doing a big or small wedding. 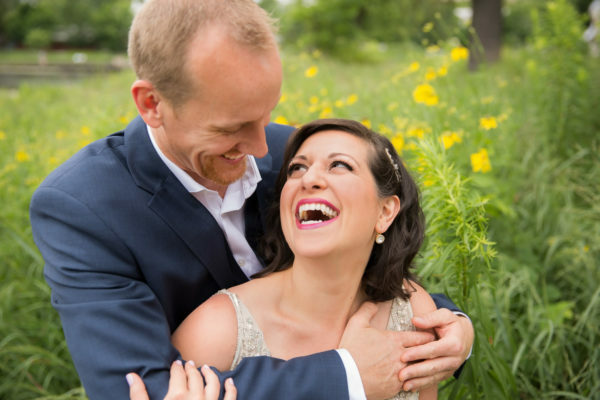 In addition to photography we offer hair & makeup (because who doesn’t want to get a little pampering on wedding day), flowers (for that perfect pop of color), video (especially great if you don’t have family coming) and two officiants (in case city hall isn’t for you). It is your wedding day, so why not treat yourself! So What is the Ceremony like? As with any wedding, there are no two that are the same. 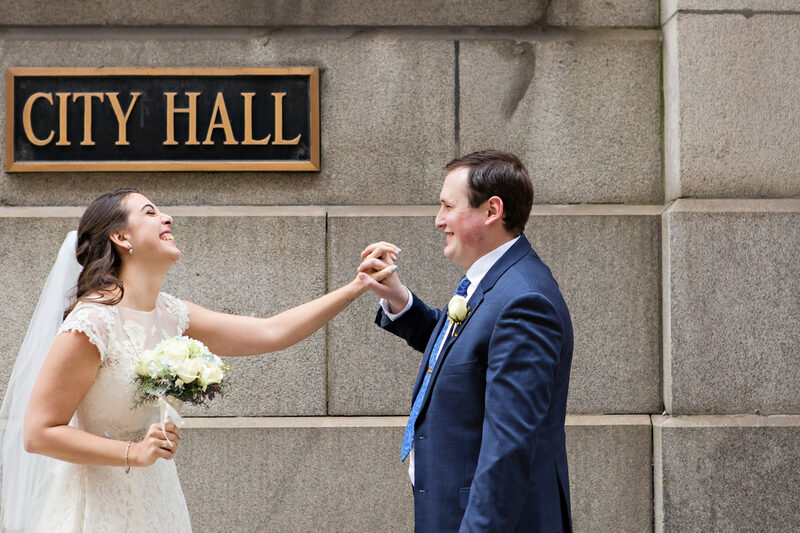 When getting married at City Hall a judge will preform the ceremony. The judges rotate so I’ve rarely seen the same judge more than once. They have a script they will read from and if you have rings you will exchange them. The entire ceremony is about 5 minutes long. Some judges will ask you if you’d like to say anything to each other or if you have your own vows. And you can definitely say a few words of your own to each other to personalize things a bit if you like, but it’s not required. Just be sure to let the judge know before they start the ceremony that you want to do that in case they don’t ask. Sometimes the wait is non-existent and sometimes you may wait an hour. It is first come, first married so no appointments can be made. There is a waiting room, but on very busy days the line spills into the hallway. Friday afternoons and Saturday mornings are always the busiest. Other dates like Valentine’s Day tend to be very busy as well. Often on those dates and Saturdays they will have two judges doing ceremonies to keep things moving. Also on Fridays and Saturdays couples tend to have more guests so it may appear very busy, but 2/3 of the people may be guests. It’s always a pretty fun environment, so even if you have to wait it’s not so bad! I’ve been down there when people have made a human tunnel for the newlyweds to run through when they come out and people are always taking photos and clapping and cheering. I wish it wasn’t in the basement, but it’s a joy compared to other areas of city hall (I’m looking at you traffic court!). 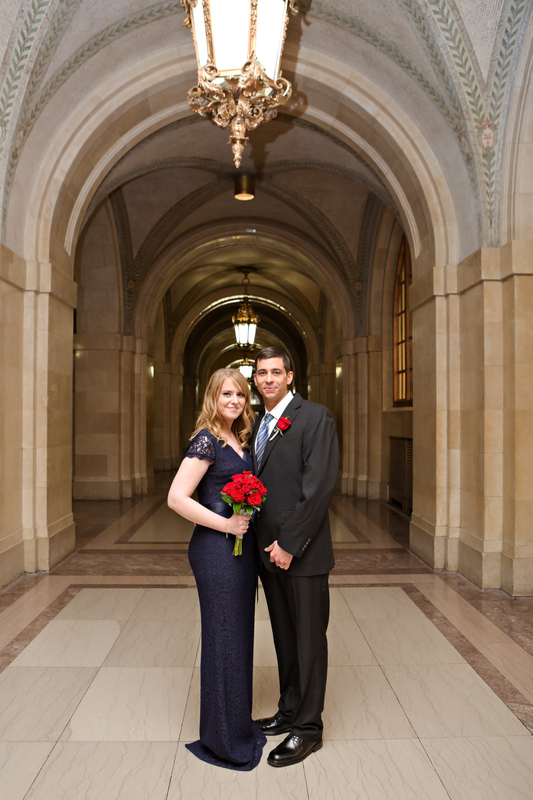 After the ceremony we usually head upstairs to explore the gorgeous halls and archways of the building. You always get many people walking by offering their congratulations. The halls are generally busy as people are constantly coming and going, but it’s part of the experience. 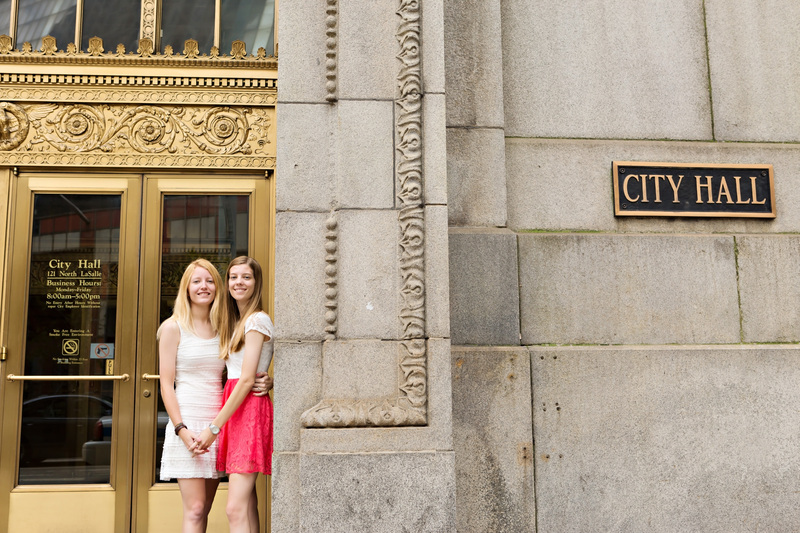 The outside of the building offers beautiful golden doors and the city hall sign for that “Guess what we did! !” photo. Around the holidays they have the doors and entryways decked out as well. If you’re looking for some photo ops nearby, there are some great options in walking distance. Just a couple blocks east is the iconic Chicago theater with its glowing sign. Around the corner a few blocks south and you will run into the Board of Trades building. A couple blocks north and you’re at the Chicago River with its red bridges and revamped Riverwalk complete with a few places to grab a post-wedding cocktail and take in the view. 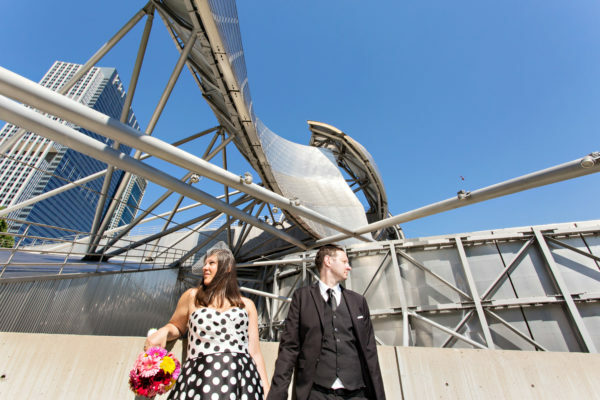 If you’ve googled Chicago City Hall Weddings you may have come across weddings at the Cultural Center. They do 10 ceremonies there one Saturday morning each month. These require appointments and are pretty hard to get as the Cultural Center is a much more picturesque option and the $10 fee is a fraction of what is costs to have a big wedding there. 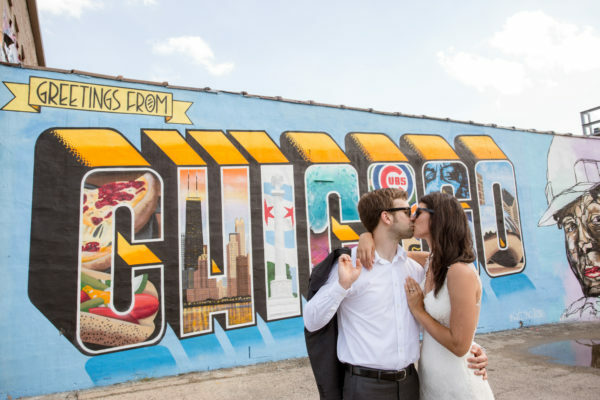 To book one of the spots you have to go to 119 W. Randolph in person, with a valid marriage license and your $10. So you can’t book those more than 60 days in advance since the license is only good for 60 days. Most people will get the license and go right across the street to try to get one of those spots. 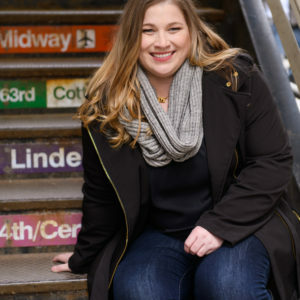 So if you’ve been considering City Hall as an option for your wedding day I hope that this article has helped shine some light on the process! 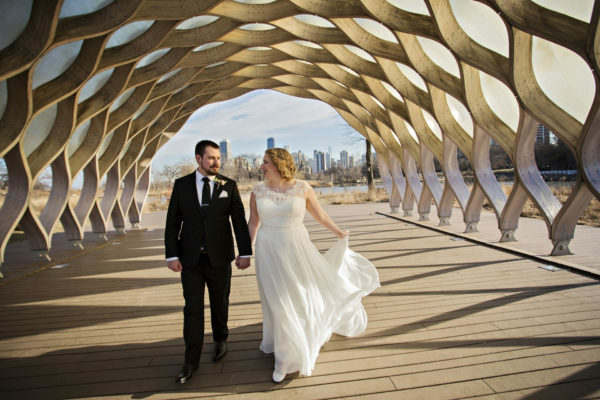 Becky Brown is the owner and principal photographer at Becky Brown Photography and Elope to Chicago.